Tammy's Spot: Your Kindness . . .
A little playtime with a stencil, distress and black ink! This is lovely Tammy! The bright colours really pop with the black. Tammy this is absolutely splendid! What a burst of color and fun! Very pretty, Tammy, and looks like lots of fun. Wow! Those vivid colors really make the black pop! Gorgeous, Tammy! One word would probably sum up this card completely - gorgeous! But, you know me.........I LOVE IT! The colors are so vivid and beautiful. A stunner or a card! How beautiful! I love the colours in there too! Stunning background. I like the flower silhouette against those fun bright colors. 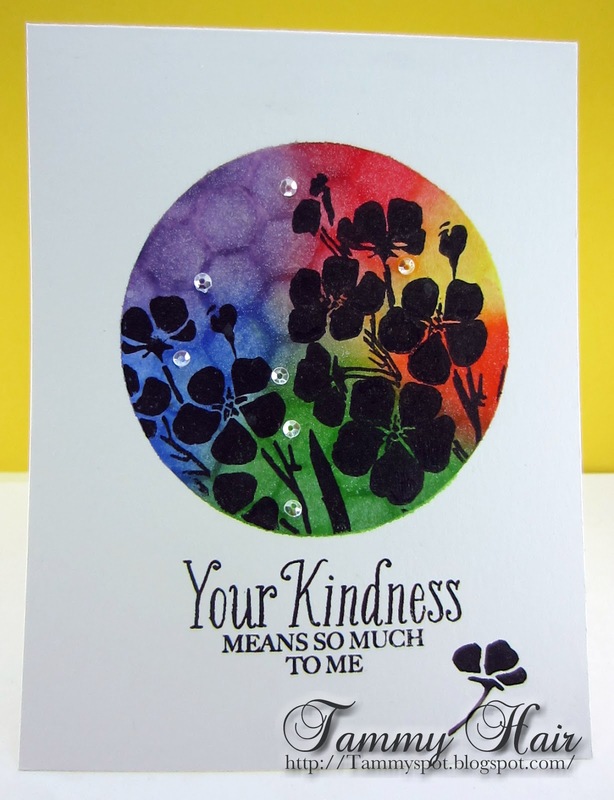 Love the vibrant background you created for this beautiful card. Beautiful background Tammy..love the delicate sprinkle of sequins..
wonderful background on this card.